For my big brothers birthday I was commissioned to make him a couple cards. With his favourite colour being blue I thought it only fitting that all 3 of his cards were done in blue. 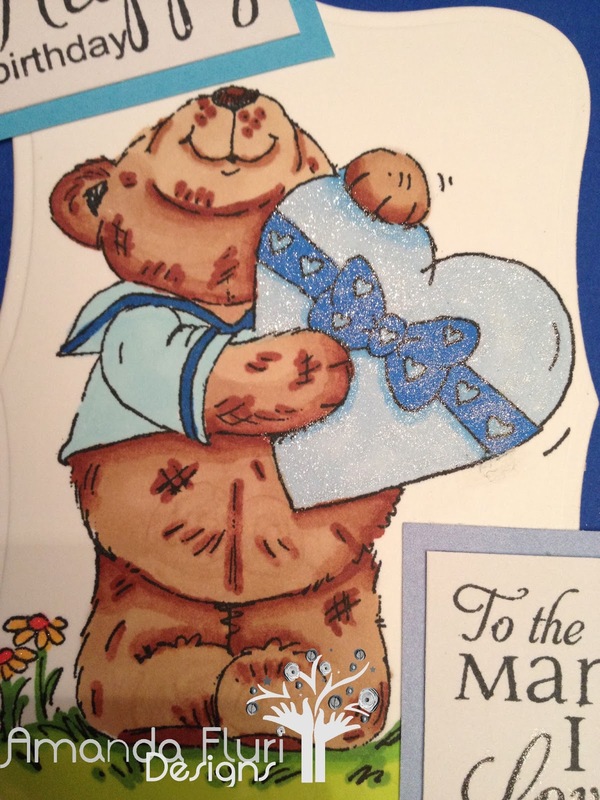 The first card that is shown below is the card that my sister-in-law had ordered for my brother. I stamped this really cute Penny Black image (Heaven Knows is the name of the stamp) and I stamped it in Momento Tuxedo Black Ink on 110 pound cardstock, and I used letraset promarkers to colour the image. I used some Doodlebug Beetle Black Doodle Twine and wrapped it around the front of the card. I then cut out the image and mounted it on blue paper, and used Spellbinders Nestabilities Lables 8 Die and mounted it using Mono Multi Glue Once that was done I used wording from a couple different stamp sets Amy R's It's Your Birthday Stamp Set and (which I will link to later when I have the set infront of me), and finished it off by using my clear wink of stella...(which I LOVE I must add)... to the heart that the bear in the image is holding, and to the flowers, and finished it off with a couple little blue gems, and rounded the top left and bottom right corners, and VOILA finished card...Sounds easy right?!. Here you can see the front of the card. The second card I was asked to make for my brother from my sister. When it comes to desiging cards for my sister, she loves to watch my creativity run wild and to see what I can just design. She also knows that my brother likes blues, so she asked me to design in it, but the rest of it was left up to me. I thought in designing this one that it would be kind of fun to play with peel offs as I havent played with them in a while. I wont link to theses peel offs because they are now discontinued, so in order to not get your hopes up I won't be able to link. I used 3 different sized and designed gifts, and placed them in a row along the bottom of the front of the card, with the largest one in the middle. I then went to my letraset promarkers and coloured them in using alot of the different hues of blues that I have. The card basically finised itself at that point. I took a couple tag peel offs from the set and wrote my brothers name in them, and tied around a shimmery silver ribbon to tie in the outline of the peel offs, and then went crazy with my clear wink of stella and added tons of glitter. I then finished up my card with wording from Amy R's It's Your Birthday Stamp Set...which I must confess is currently my favourite set for birthday wordings. And last but not least is the card that I made to give to my brother. My brother for as long as I can remember has loved music. He is an incredible guitar player and an amazing singer. 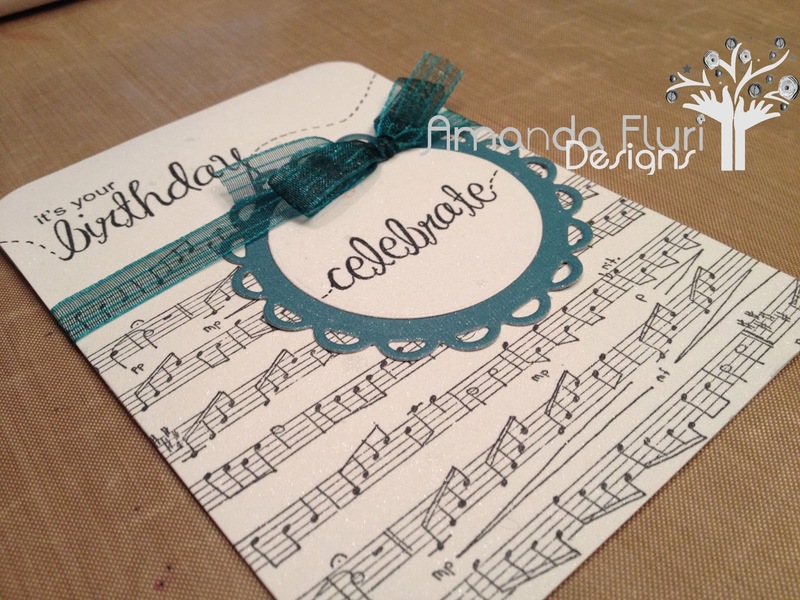 I wanted to bring his passion for music to his card. Being from a fairly musical family I can honestly say I have quite a variety of musical type stamps. 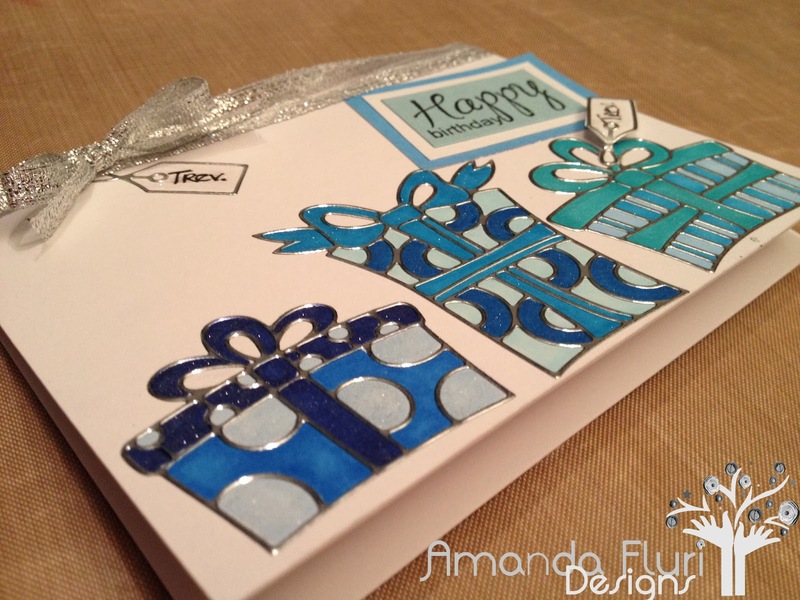 I used a rubber stamp from Under Construction Stamps and stamped it twice to get the background of the card. I then used a turquoise/aqua coloured ribbon around where the sheet music appears to stop. 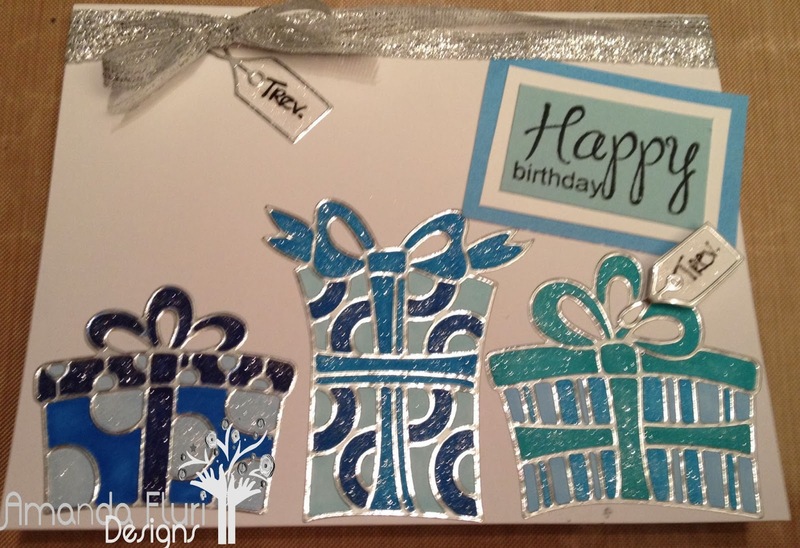 I added in wording from Amy R's It's Your Birthday Stamp Set and cut out the wording "celebrate" using Spellbinders Nestabilities Scallop Circles Dies and used some matching scraps of turqoise/aqua coloured paper. I used more wording from this stamp and stamped it at the top. 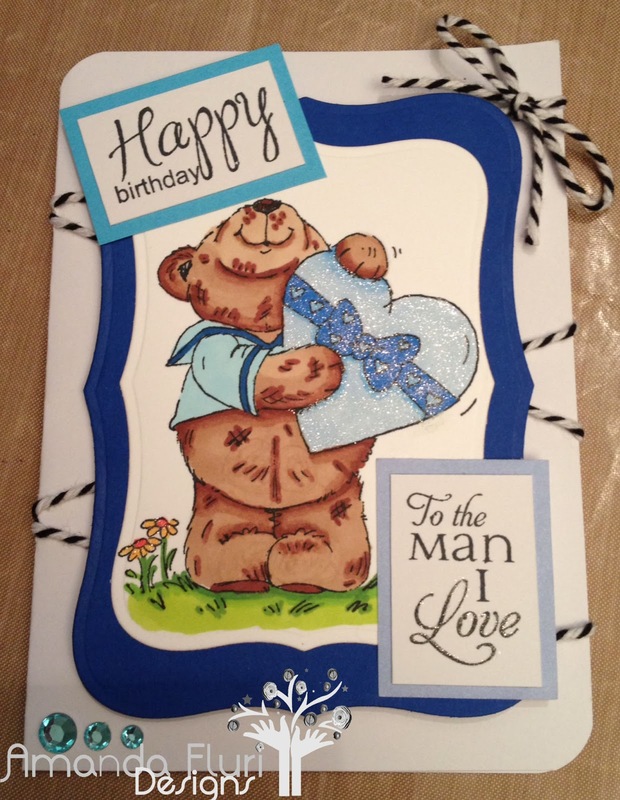 I added in some little dash lines to make it look like the wording was more tied into the card. I like how simple it looks, but yet how classy it is. Here you can see a side view of the card as there are minimal elements so you should be able to see everything from this view. He seemed really excited to get 3 original Amanda Fluri Designs!